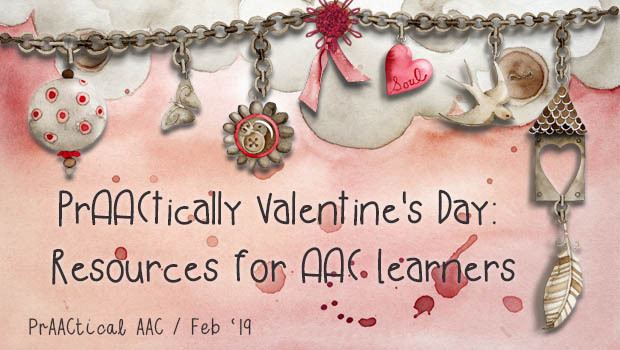 As our thoughts turn to Valentine’s Day, we polished up one of Robin’s old posts with lots of resources to explore. Enjoy! Valentine’s Day is a theme that seems to take center stage in February. When we use this theme, we like to focus on it before, during, and after February 14th because then there are a lot of opportunities to talk about it before, during, and after the holiday. This is like a conversation which involves so much more than talking about the ‘here & now’. Core Vocabulary Activities: Check out these fun ideas from teachers and clinicians. Create your own digital candy hearts with your own text with CryptoGram. Word clouds are a fun way to integrate a theme. You can read more about how to use them in AAC lessons here and here. You can also insert your own Valentine’s Day text into an online image generator using Image Chef and other websites. What else can you do with them? You can use sites like this one to share the love with a sick child and practice empathy along with AAC. If you’re looking for apps to create language learning and AAC practice opportunities, check out these suggestions. Draw with Hearts- Happy Valentine’s Day– Free – Can be used for creative drawing, cause-effect activities, and or guided drawing. i See quence…Valentine’s Day Social Stories-Create or read social stories about Valentine’s Day. Can be used as a schedule and fully customized with photos and voice. Nice check-off system for completion of steps of activities. Photo Story Apps can be used to write stories about love or Valentine’s Day. Pictello, Story Creator, Tapikeo, are just a few examples. Story Creation with Character Apps can also be used to write fantasy or pretend stories about love or Valentines Day. Toontastic, Puppet Pals) are just a few examples. Word Art Apps can be used to take pictures of things about love or Valentine’s Day and then to write or copy words that go with the picture. This can be done at the letter, word, or sentence level using apps like Word Foto. Text Caption Apps- Can be used to highlight keywords or sentences about a photo using apps like TitleFx. Card Creation Apps- Create Valentine’s Day Cards with photo apps and/or pre-made cards. Can practice signing name, writing messages, and communicating with parents, teachers, peers when giving and receiving cards. A good time to practice giving compliments as well using sites like Paperless Post. Looking for books with a Valentine’s Day theme? Here are some ideas to get you started.